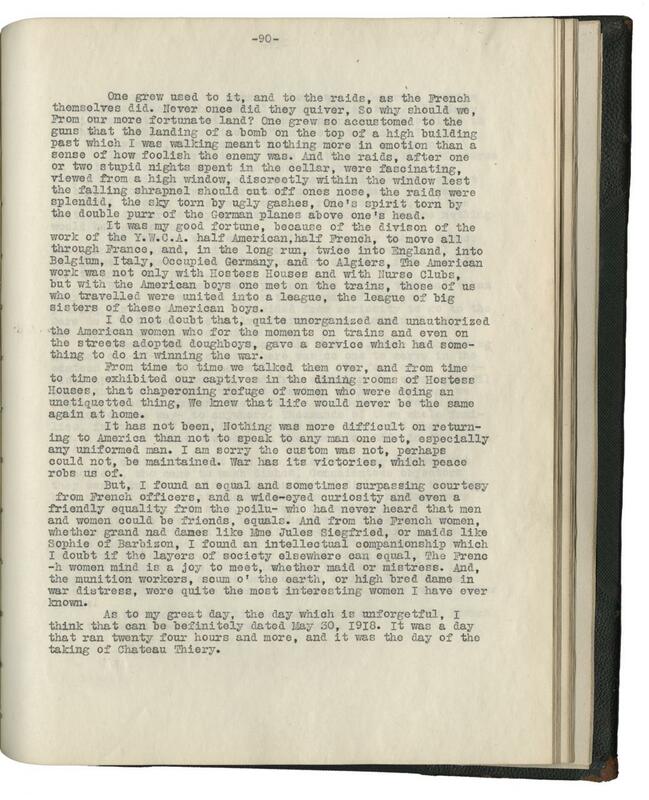 Today's entry comes from a volume collected by members of the Hamline community, detailing the war work of the Hamline women serving as nurses and with the Y.W.C.A. overseas. Keith Clarke, a woman working as Director of Publicity for the Y.W.C.A. in France describes spending from 8 PM to 8 AM the next day with three other women feeding and comforting the refugees coming through the train station near where she was stationed. The refugees were fleeing the Chateau Thierry area, as this was the beginning of a battle which lasted until July 18. Clarke describes a midnight raid that necessitated moving a thousand refugees into the subway station underground and then back up to the canteen when the raid was over to continue serving them. She also tells the story of an old man sitting alone in the train station, ignorant of the commotion around him. The man had been separated from his wife two days prior, and knew he would never see her again. Clarke's heart went out to the man, and she did everything she could to try and help him, offering him both soup and coffee, and keeping an eye on him throughout the night. 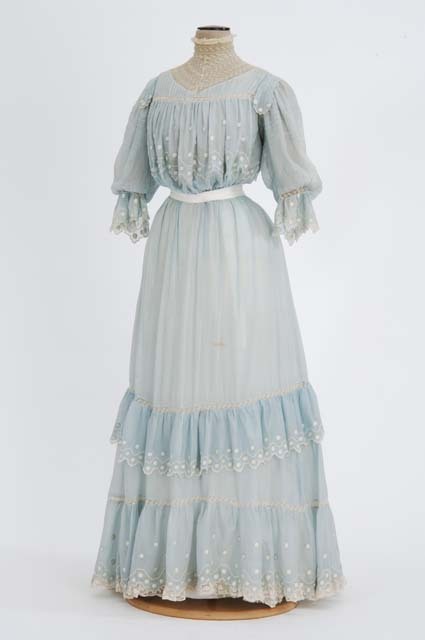 This blue summer lawn dress was worn between 1900 – 1909 by Mary Saunders of Saint Paul. 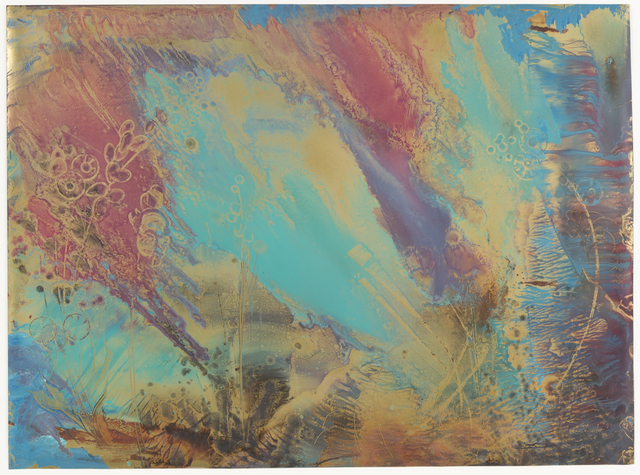 This 1960 painting by Florence Parlin is titled "Summer." Does it say summer to you? Parlin was a member of the Hanicraft Guild in Minneapolis and later founded the Rochester Art Center. 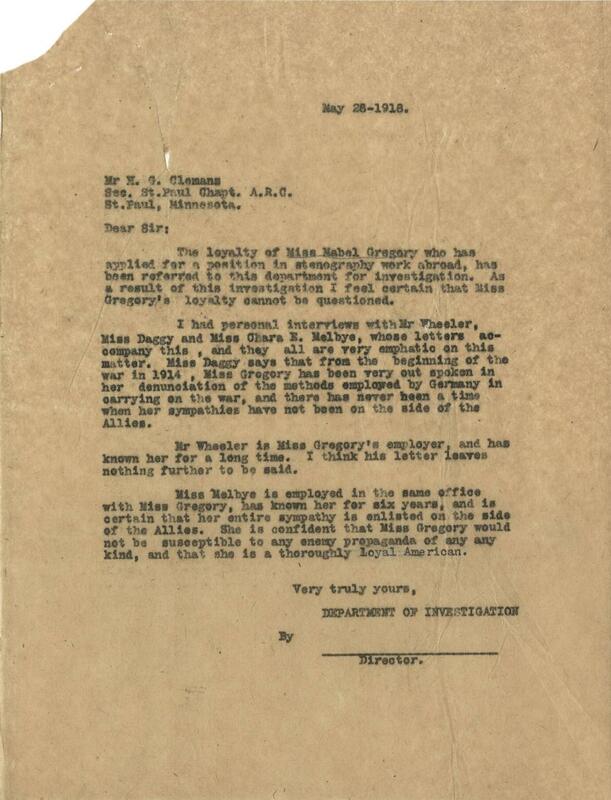 When someone applied to work for the Red Cross abroad, they were required to prove their loyalty to the US and the war effort by submitting several letters of recommendation. 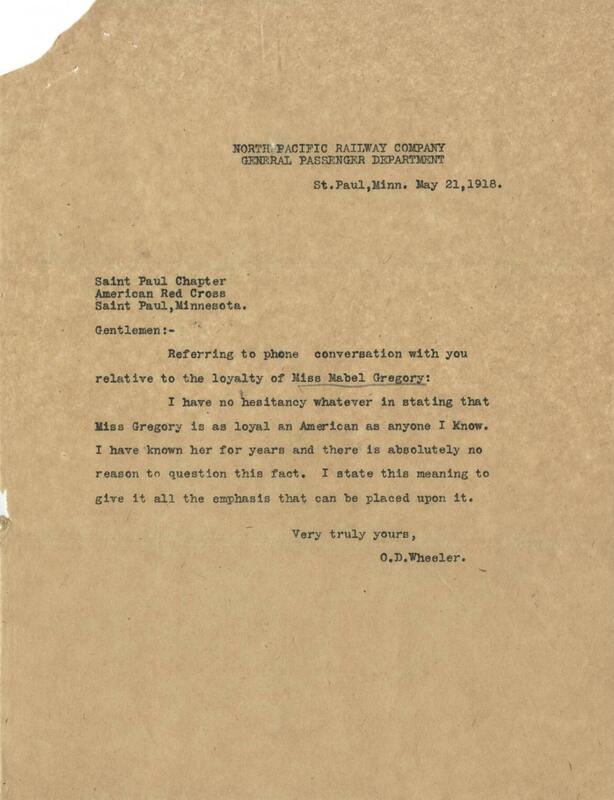 This document shows the investigation into Miss Mabel Gregory of Saint Paul, summarizing the information received, and stating that none of the references gave any reason to doubt her loyalty. Miss Gregory was, by all accounts, the ideal loyal American who would not succumb to enemy propaganda. 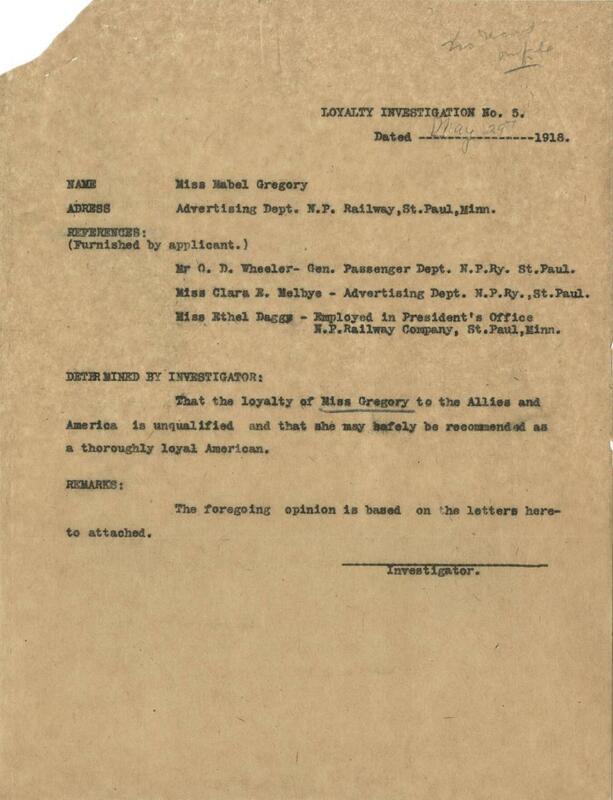 The loyalty of Miss Mabel Gregory who has applied for a position in stenography work abroad, has been referred to this department for investigation. As a result of this investigation I feel certain that Miss Gregory's loyalty cannot be questioned. I had personal interviews with Mr. Wheeler, Miss Daggy and Miss Chara E Melbye, whose letters accompany this and they all are very empathetic on this matter. Miss Daggy says that from the beginning of the war in 1914, Miss Gregory had been very out spoken in her denunciation of the methods employed by Germany in carrying on the war, and there has never been a time when her sympathies have not been on the side of the Allies. Mr. Wheeler is Miss Gregory's Employer, and has known her for a long time. I think his letter leaves nothing further to be said. Miss. 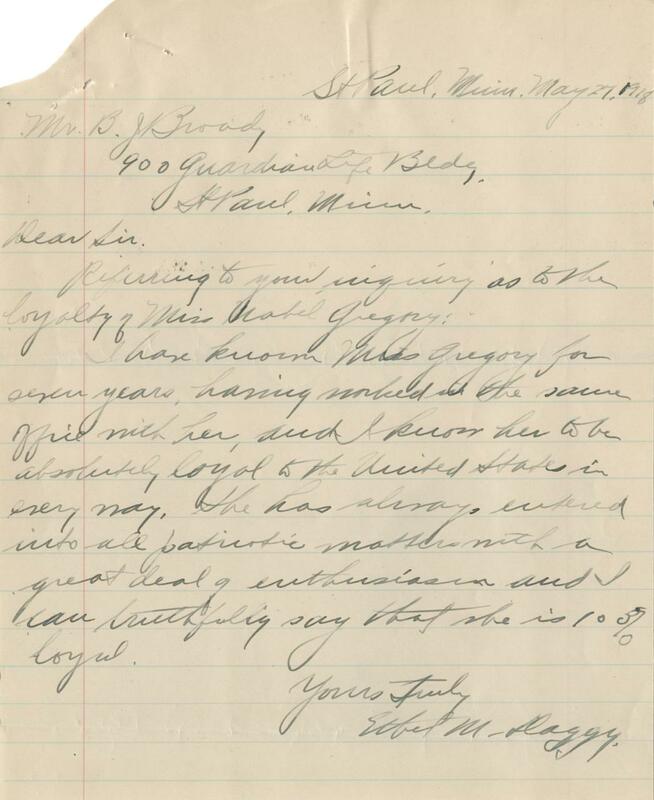 Belbye is employed in the same office with Miss Gregory, has know her for six years, and is certain that her entire sympathy is enlisted on the side of Allies. She is confident that Miss Gregory would not be susceptible to any enemy propaganda of any any kind, and that she is a thoroughly Loyal American. 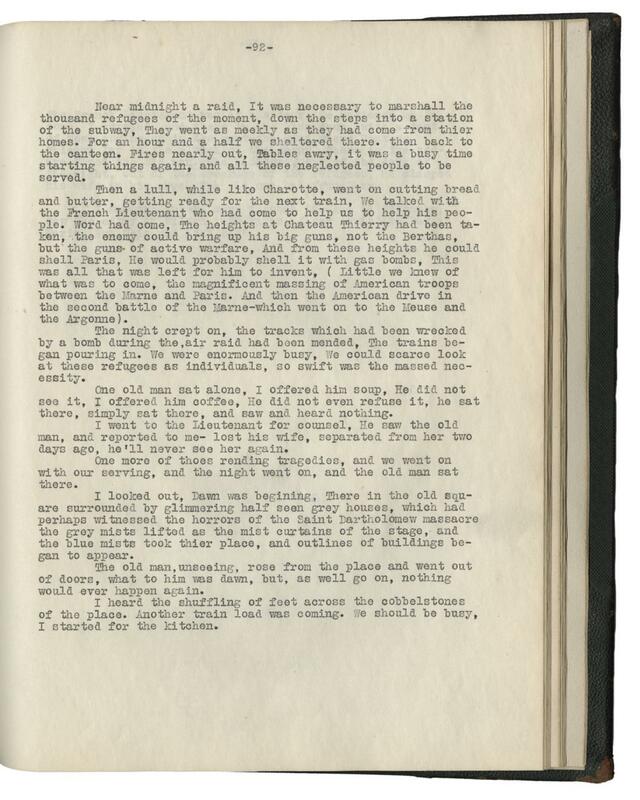 This is an excerpt from the diary of Edward Gilkey which was taken off his fallen body and returned to his parents after he was struck by a high explosive shell in The Second Battle of the Marne. 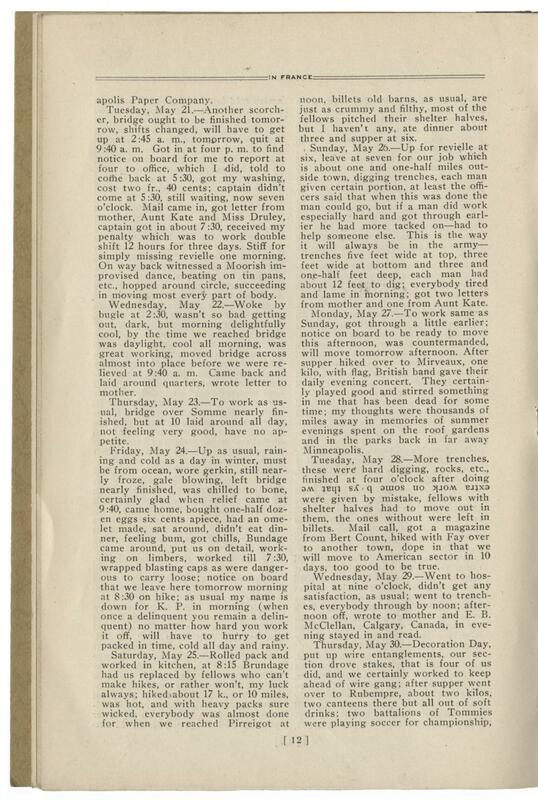 His parents had the diary published in memory of their son. 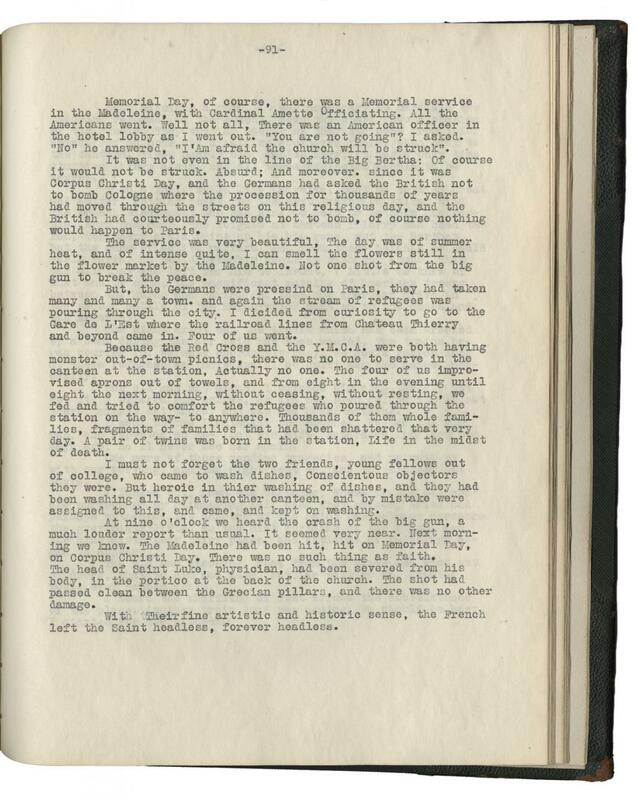 On this date in 1918, Gilkey writes that he went to see the British band play. During the concert, he states he got lost in his thoughts and found himself returning to Minneapolis in the summer, sitting on rooftop gardens or in the park. He says the music, "stirred something in me that had been dead for some time." Monday, May 27th.-- To work same as Sunday, got through a little earlier; notice on board to be ready to move this afternoon, was countermanded, will move tomorrow afternoon. After supper hiked over to Mieveaux, one kilo, with flag, British band have their daily evening concert. They certainly played good and stirred something in me that has been dead for some time; my thoughts were thousands of miles away in memories of summer evenings spent on the roof gardens and in the parks back in far away Minneapolis. 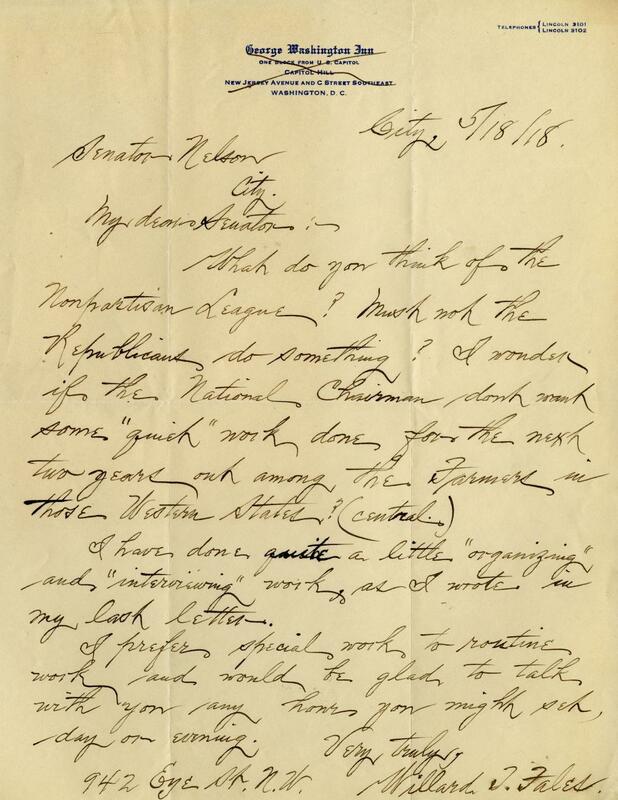 A letter to written to Senator Knute Nelson on May 18th 1918, from Willard Fales, asking what the Republicans are doing about the Nonpartisan league. Fales offers his services to help deal with the situation, saying using quotation marks to hint at a more nefarious meaning. What do you think of the Nonpartisan League? Must not the Republicans do something? I wonder if the National Chairman, dont [sic] want some “quick” work done for the next two years out among the Farmers in those Western States? (Central.) I have done quite a little “organizing” and “interviewing” work, as I wrote in my last letter. I prefer special work to routine work, and would be glad to talk with you, any how you might set, day or evening. 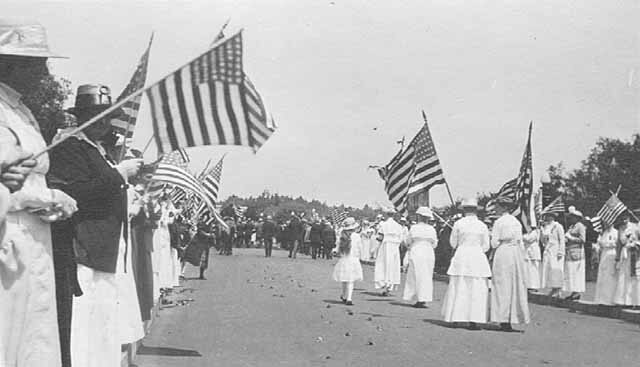 This photo is of a Memorial Day parade one hundred years ago in 1918. World War I wouldn't end until November of this year. Note the many flags and the white dresses, the dress color of the suffrage movement.